They handed it to her. She’d be crazy not to. 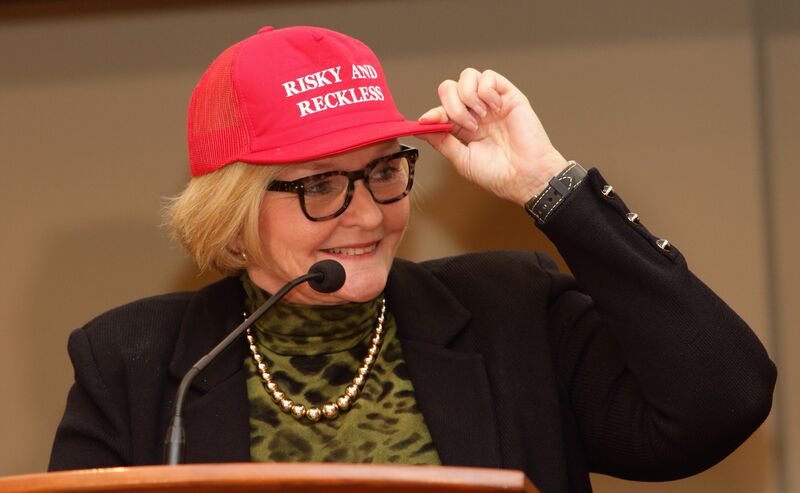 Senator Claire McCaskill (D) [2016 file photo]. The Congressional Budget Office scored the cost and effects of Trumpcare today. It wasn’t pretty. Raising a 64-year-old’s premiums 758% is not Claire’s idea of healthcare. This plan is bad for Missouri, bad for the 24 million Americans who would lose their coverage, and especially bad for seniors, rural communities, and people with disabilities. Didn’t anybody do the math on a few scenarios??? It has been just vindictive, greedy policy for Republicans – who have lifetime free care. Thank goodness for the CBO or we might not known the full extent of the horror. We’ll have to scrutinize every last thing of any revised plan. No wonder they were fast-tracking it. ACA had 79 hearings and took 14 months to pass. We’ll need to insist they slow down and allow study of something that can cause people’s deaths if not done right. It’s a republican product, they don’t do math. If you voted for that piece of crap Drumpf, I don’t have one ounce of sympathy for you. You deserve what you get. But the millions of innocent people who had better sense than you are going to suffer, too. That truly pisses me off. Nice going, Republican idiots. They’ve shot their mouth off for the last eight years, they had to do something. Even if it’s wrong. Goes to show what the GOP thinks of the average voters intellect level. They have a point there. Holy Toledo!! What actually is the point of this legislation? It certainly isn’t offering an option for healthcare. That’s easy. Massive tax cut for the top 1%. Thank you for the support and dedication to protect all families in Missouri. Perhaps our other esteemed Senator could learn what compassionate leadership is all about. Thank You! Roy? Seriously? He’s not worried, he has a really nice mansion in Georgetown. I was happy to get multiple, big glossy ads asking me to contact you and tell you it was time to repeal “Obamacare” and replace it with Trumpcare,” because that is one way I enjoy the Republicans wasting money. Give’em Hell, Claire. No need if you don’t have insurance. That’s their brilliant plan. Republican values. Why do so many people vote against their self-interest?? You must be new around this here country. It looks like they just want older people to die from no health care. Well, yes. Unless they’re in the top 1%.